Ruben Fleischer at a recent photo call for Venom. Sony’s Spider-Man-free Venom solo movie is finally upon us, and as wild as it might sound to comic book purists, the film totally works without the titular antihero’s nemesis. 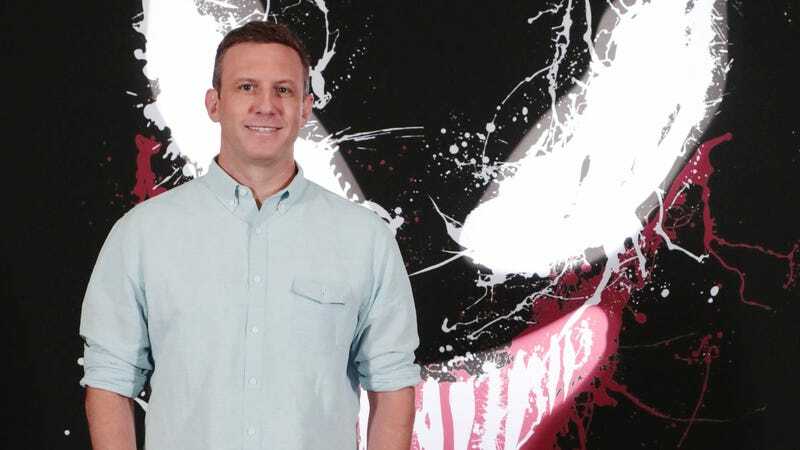 We recently spoke with director Ruben Fleischer about his personal connection to the source material, and why deviating from Venom’s canon actually gave him the freedom to explore the character in interesting new ways. io9: As a filmmaker, what drew you to this project? Ruben Fleischer: I guess as a long time fan of Venom, as soon as I heard they were making a standalone movie I got really excited at the prospect of being involved. There’s just not a more iconic character, visually. He’s so graphic in his look with those giant eyes and mouth and tongue and the black and the white—Venom’s just really foreboding, a formidable character within the canon of the Marvel world. He’s somebody I’ve always been drawn to and just thought would make an excellent antihero in a film. I really wanted to do something a little bit different from the other Marvel and DC superhero films we’ve seen and really digging into this monstrous antihero was the perfect way to do it. io9: What themes did you really want to capitalize on in the story to set it apart from other antihero comic book movies? 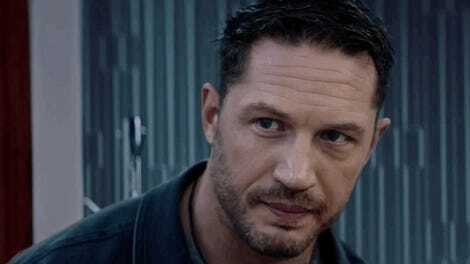 Fleischer: You know, duality has an always been a strong theme throughout Venom-focused stories, whether it’s in the comics or in movies, and that’s something I think that Tom Hardy’s played with in a lot of his work. This notion of your Jekyll and Hyde nature, your id and ego or having to manage this unknown Other with crazy impulses that lives inside of you. That’s a metaphor that can be extracted in a lot of different ways and so it was a very exciting thing to play with. io9: Obviously, the film’s version of Eddie Brock is somewhat different than iterations of the character many people are familiar with. io9: To you, who is this Eddie? Fleischer: Eddie is a guy who’s always putting himself before others, you know? He’s selfish. He’s got a past in New York City we refer to and we hint at some sort of scandal that drove him from there to the West Coast—and then with his new fiancée Anne, there’s a moment in the film where he makes a decision to put himself before her and that’s kind of the beginning of his downfall within the scope of our film. He’s a person that has to learn to go from being selfish to being more selfless, and what better way to learn that than having your body taken over by another being where you’re not in control, and you can’t think for yourself, and you can’t do whatever you want because you have to negotiate a giant alien monster who lives inside of you. And you have to learn how to find a balance with that creature to be able to live together. io9: Who is this Venom? Fleischer: As far as Venom, we took some license with this because I don’t think we know a lot about him from his days on planet Klyntar in the comic. But in our movie we thought maybe he could also be somebody who’s a little bit of a loser, a loner, and doesn’t love being subordinate. So when he gets to Earth and he gets to share a body with Eddie and experience all these things like the beauty of our world and the love Anne shows, that humanizes him and he begins to undergo a change as well, which is “I kind of like it here because in my world I’m just another small fish.” On Earth, he can become a big fish. He finds a kindred spirit in Eddie and decides that Earth is a place that he wouldn’t mind staying—but if he’s going to stay, he wants to be the only one here of his kind. io9: Given how large a role Spider-Man plays in Lethal Protector specifically, what was most challenging about leading with that arc for Venom’s first outing as a hero? Fleischer: With all things in the movie, we wanted to take as much as we could from the comics, but also be able to infuse it with our own invention. In the Lethal Protector series, Eddie and Venom leave New York and arrive at a truce with Spider-Man and go their own way. So we use that as a launch point for our story, which takes place in San Francisco and we like to imagine that now Venom’s now in a narrative space where it can stand alone. Because of the nature of the way this movie was put together and that there was no Spider-Man, we had no choice other than to invent a new origin for him and to rethink our approach to this story. So, I like to think of the movie as an ultimate version of the Eddie/Venom story. io9: In some of Marvel’s more recent Venom comics, Eddie’s relationship with the symbiote has a decidedly more romantic nature to it. It’s not exactly sexual, but they do refer to one another as “love” frequently. Did that all factor into the how you went about crafting the film? The Eddie/Venom interpersonal dynamic has been the key to all the comics. It’s gone through a period of acceptance, but there are also periods of rejection, dependence, and addiction. Like any like relationship people have with another person, it goes through different phases. And so we focused on their getting to know each other here. Obviously, Eddie has to come to terms with this awkward new reality about his identity...I think that allows us to go explore that relationship even further down the line. io9: So, in your view, where does Venom as a franchise go next? Fleischer: Well, we lay the groundwork for a few of Venom’s more iconic foes that I think the fans are really going to be excited to see. But at some point down the line, I think what everyone really hopes is going to happen down the road is that we’ll see Eddie and Venom finally take on Spider-Man.